Clean the paint and boost your sealant or coating in one step! McKee's 37 Rinseless Quick Wash & Gloss Kit will not only clean your car and enhance the shine already in place, but it also helps you save time, water, and money! The included bucket and Grit Guard help prevent washing-induced swirls and scratches, while the specialized formula of McKee's 37 Rinseless Wash & Gloss removes dirt while leaving behind a glossy finish. If you’re in an area that has water restrictions, or even if you only have just enough time for a quick wash, McKee's 37 Rinseless Quick Wash & Gloss Kit gets you the finish you want without a huge process. A total retail value of $64.95. You save $24.96! This is a great value if you need all of these items. The fact that the bucket is translucent and has volume indicators is nice. 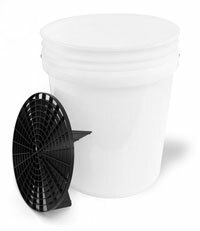 The bucket is a little tighter in diameter than a standard hardware store bucket, so the grit guard is a tight fit and you will not be able to get a Cyclone Dirt Trap to the bottom, if you want to combo it with a grit guard (as I intended). I would have liked to see a simple lid included and a larger size drying towel than 16x24 (the Wolfgang kit includes the larger Guzzler). This is my first experience with the Guzzler Waffle Weave, but the tow lints like crazy. I washed it with my microfibers before using and noticed a bunch of lint stuck to the edge material of the towel, and found additional lint from the waffle material in the lint trap. I'm not sure if this towel has cotton, but the lint sure looked that way. ConsNon standard size bucket is a little tight in diameter (grit guard fits tight) No lid for bucket Guzzler drying towel is small and lints, so wash and dry by itself the first time (not with your other microfiber towels).